South Carolina State House. Photo by Joe Shlabotnik. As many states begin their legislative sessions this week, some lawmakers are conflicted over whether to proceed with strict immigration enforcement measures, forcing them to balance immigration measures with other pressing state priorities. Understandably, state legislators want to see something done about our national immigration problems, but many are expressing concerns over the potential harm Arizona copycat laws could have on their state—including expensive court battles, racial profiling and backlash from religious, state law enforcement and business groups. 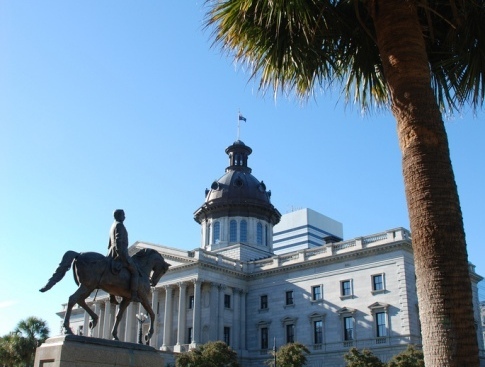 In South Carolina, the farming lobby is putting pressure on lawmakers considering “papers please” Arizona-style legislation to also consider farmers who need seasonal labor. Last week, amidst questions on the bill’s legality, South Carolina legislators sent an Arizona copycat bill (SB 20) to committee for further discussion. This week, however, the American Farm Bureau said it would pursue a policy that “assists the federal government in helping states create programs that give growers access to enough legal labor”—that is, temporary legal status. So far, all of these state programs have been on enforcement only. They don’t address the fact that we don’t have an adequate labor supply in agriculture […] If a state can venture into the arenas of enforcing immigration, then they can venture in the arena of granting temporary legal status. Similarly, the Florida Hispanic Caucus, Florida Catholic Conference, Florida Police Chiefs Association, farm-worker advocates, farmers and business groups joined Republican State Senator Mike Bennett in his concerns over Florida’s immigration enforcement bill (SB 136). Sen. Bennett, who is actually the bill’s chief Senate sponsor, worries the bill may lead to racial or ethnic profiling. The Florida Senate met on Monday to discuss an Arizona-esque immigration enforcement bill. Florida Rep. Bill Snyder plans to introduce a similar version in the House this spring. In Mississippi, Public Safety Commissioner Stephen Simpson told the Mississippi State Judiciary Committee yesterday that Mississippi’s enforcement bill (HB 54 and SB 2179), which requires state law enforcement to demand proof of citizenship during stops for traffic volations, would “require his department to hire 11 experts, at a cost of about $1.2 million a year, who would pore over suspected illegal immigrants’ documents to determine their validity.” That cost, Simpson said, would be in addition to the cost of housing immigrants and transporting them to detention centers. In an economic downturn, Kentucky does not deserve the kind of publicity and national notice that will come with the passage of a bill like this. So I ask you, please don’t do that to us at this time. Kentucky Sen. Perry Clark (D-Louisville), who is joined by the Catholic Conference of Kentucky, Kentucky Council of Churches, the American Civil Liberties Union and the Kentucky Equal Justice Center, believes state legislators are caving to the recent wave of state enforcement laws. While state legislators continue to consider their own versions of Arizona-style enforcement laws, the voices of dissent continue to grow. Legislators should carefully consider how the bill unfolded in Arizona—a bill that was, for the most part, gutted by a federal judge. They should also consider the fact that as legal costs to defend the anti-immigration bills continue to grow, we still have no solution to our broken immigration system.